I’m starting to worry about Punkie and his apparent obsession with getting solid food. The older babies at day care sit down for solid food three times a day – morning, noon, and late afternoon. 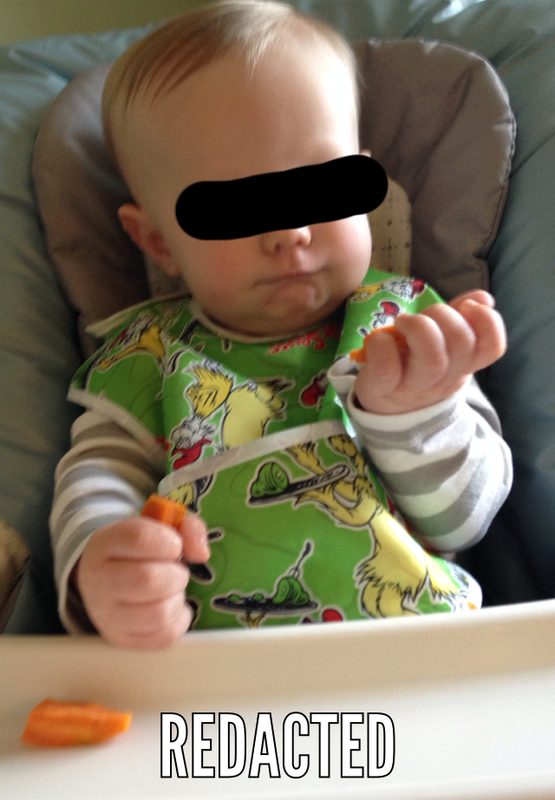 Punkie gets finger food one time per day – usually fruit, Cheerios, and/or puffs. Some of the older babies are mature enough to sit at a short baby-sized table, rather than in high chairs. Punkie is not one of the babies at the table – he’s only 8 1/2 months old and not ready for that. The “older” babies are closer to 12 months old. But I’m told that he now crawls over, pulls himself up into a standing position next to the table, and STEALS FOOD from the other babies. Really? I honestly don’t know how to work through this one. I can’t talk to Punkie about it, obviously – he’s 8 1/2 months old. Day care is pressuring me to allow them to feed him solid food three times a day, but our pediatrician advised that we shouldn’t increase solid food until he’s 9 months old because an increase in solid food means a decrease in milk and milk should be his main source of nutrition at this age. At home, he isn’t ravenous and he doesn’t try to steal food. He doesn’t even complain when we’re a little bit late with his bottle. And I’m wondering – does this mean that he’s overly susceptible to peer pressure? I guess we’ll just have to work through it until I can talk to his pediatrician about his diet. This entry was tagged baby diet, baby solid food, lawyer mommy, mommy blog, peer pressure. Bookmark the permalink.